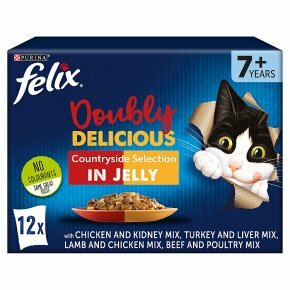 Beef & Poultry, Chicken & Kidney, Lamb & Chicken, Turkey & Liver FELIX® As Good As It Looks Doubly Delicious meals are packed with two kinds of tender meat, as well as a succulent jelly. And now thise's a recipe designed specially for senior cats (aged 7+), to ensure they get all the nutrition they need - as well as the taste they love! Our Doubly Delicious Senior Selection contains four irresistible recipes: Beef and Poultry, Chicken and Kidney, Lamb and Chicken, and Turkey and Liver. Each meal has been designed to meet your senior cat's needs with a combination of protein, minerals, and vitamins, including antioxidants. Each dish will be full of healthy goodness to satisfy 100% of your cat’s daily needs. Truly delicious!